I use sweet relish frequently usually in my tuna salad or on a hot dog which I love no matter how bad they are for you. Lately I have been substituting bread and butter pickles chopped instead of relish in to my tuna salad, Mr.Picky in particular enjoys it this way. So this year with the cucumbers from the garden I decided I would make a sweet/bread and butter relish. I combined my bread and butter pickle recipe with a sweet pickle relish I found. I just opened up the first jar and it tastes better than I imagined. Why have I not made relish before? I got 6 (1/2 pint) jars out of this recipe, give or take some. Chop all vegetables as finely as you would like them. Sprinkle with salt and cover with cold water. Allow to sit for about 2 hours. Rinse and drain well. In a pan combine brine ingredients. Bring to a boil and add vegetables. Using a slotted spoon place relish into clean jars, add some brine if you wish. Process jars if you would like or store in refrigerator. Process pints for 10 minutes in water bath. Posted in Canning, Recipes and tagged bread and butter pickles, canning, celery seed, COOK, cucumbers.sweet relish, Home, mustard seed, Recipe, relish, Sugar, Vinegar. Bookmark the permalink. My husband’s family loves bread and butter pickles. I remember Mr.Picky telling me how much he likes them, personally I am a dill pickle girl. In fact I thought I hated bread and butter pickles, as it turns out it is probably just store-bought ones I dislike so much. Last year I had canned dill pickles and dill beans, amongst numerous other things. I thought I was through with canning when my grandmother gave me one large cucumber after the other. The cucumbers were nice slicer cucumbers but I could only eat so much. I decided I would look up a recipe for bread and butter pickles and give it a whirl. Bread and Butter Pickles II Recipe – Allrecipes.com had the best ratings so it was the recipe I went with. This recipe was amazing and not too sweet. It turns out I do like bread and butter pickles. I especially love the peppers and onions in the jar as well. Sometimes we top our sandwiches with the pickles or I will chop up the peppers,onions, and pickles to make a relish. The relish is particularly wonderful in tuna salad. Drain liquid from the cucumber mixture. Stir the mixture into the boiling vinegar mixture. Remove from heat shortly before the combined mixtures return to boil. Transfer to sterile containers. Seal and chill in the refrigerator until serving. Or can in a water bath for 15 minutes. Allow to cool before storing. Posted in Canning, Recipes and tagged bread and butter pickles, canning, canning salt, Cooking, dill pickles, homemade, onions, peppers, pickles, pickling salt, Recipe, relish, sweet pickles. Bookmark the permalink. 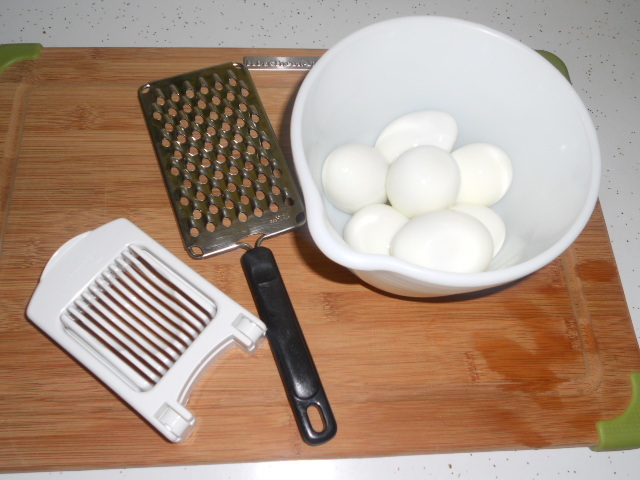 Grated or Sliced, I had never heard of someone grating their hard-boiled eggs to make into egg salad until I met Mr.Picky’s family. It totally changed the texture for me, a little too smooth. 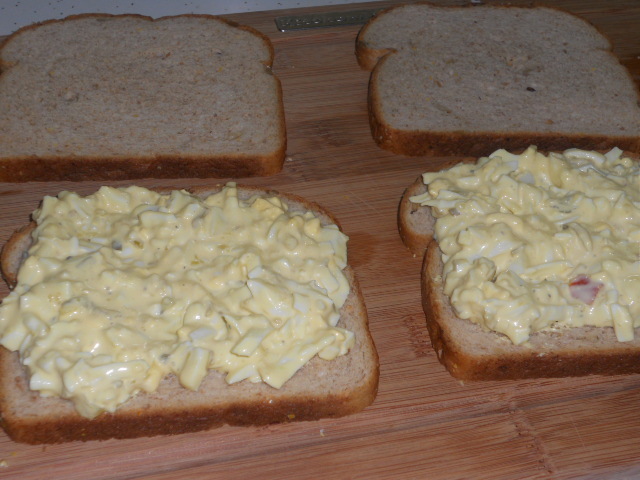 I now prefer to slice both ways with the egg slicer and then grate the half to make the perfect textured egg salad. Although my kids have eaten these many times in the past, it has only recently become their favorite. My soon to be five-year-old asks for them for both lunch and dinner. Give it a try, although I am pretty sure this is nothing new to most of you. Boil or bake your eggs however you prefer to obtain a hard-boiled egg. I boil mine with a large pinch of baking soda, it really makes a difference in peeling the egg. If I am making a dozen or more eggs I will usually bake them. Combine all the ingredients and serve on bread or in a pita pocket. If I am lucky enough to have salad sprouts around they are usually the only other thing I put on my sandwich. Posted in Recipes, Sandwiches/Burgers and tagged Boil, Boiled egg, Cooking, Egg salad, Home, Mayonnaise, Mustard (condiment), Onion, relish, Salad. Bookmark the permalink.